Lo primero para poder subir esta reputacion es tener activo el Puesto comercial, nivel 2 en nivel 2, ya con esto puedes acceder a la faccion para obtener la ganancia de la reputacion, de lo contrario no contara. Lo tercero es que armes grupo de 5 preferiblemente (1 Tank, 1 Heleer, 2 o 3 Dps incluido tu) para que en una 3 horas a lo mucho subas de neutral a exaltado. Reputation gains for both this faction and the Orcos Riecráneos seems to be disabled or bugged right now. Until this is fixed there is currently no way to obtain either follower Vindicadora Heluun / Hueso Carcajo . Edit: I just found out that there's some elite mobs, for example Ritualista de runas, with "only" 200k hp that rewards 18 reputation. Farming these means you will "only" need about 2.4k kills to hit exalted and it seems to be the best way to farm this reputation (I can't guarantee this as of now though). I suggest a grp of 5 (apparently it has been changed so you cannot have 6 people now) all with Ataque de artillería.... have a grp of 3 at the top of the ramp and a grp at the bottom in the little ditch.... you are all close enough to get rep from each other this way and the re-spawn timer is insanely fast. NOTE: There is an issue with Ataque de artillería, because you will be so far north in Talador sometimes the garrison ability will grey out. If you run out to the road until it says you are in Talador and then run back in it will reset the use of your ability. We had a Máquina de asedio sobrecargada from the Gnomish Gearworks in our group and the mobs melted away very fast. We cleared the area (Path of Glory) faster than they respawned. If you are like me and didnt got the Orcos Riecráneos (H) or Defensa Sha'tari (A), El Vergel Eterno during the event Evento de mazmorra de Draenor which gives Señal del emisario is the best time to get it. One full run gives you more than 4k of rep, and with the Puesto comercial Nivel 2, you get 5k. A lot. Dont forget your Confalón de batalla de coordinación! Every bit counts! TL:DR, kill the trash, reset, kill more. Dont forget you Puesto comercial Nivel 2. Total Defensa Sha'tari reputation earned (with the Puesto comercial Nivel 3 20% bonus) was 3288. This means without a Puesto comercial Nivel 3 you should be earning 2740 reputation per run. Will update with the amount of rep gained from Heroic El Vergel Eterno once dungeons reset. Forgot to take note of it earlier, although it looked to be in the range of 4000-5000. Total Defensa Sha'tari reputation earned (with the Puesto comercial Nivel 3 20% bonus) was 3,288. This means without a Puesto comercial Nivel 3 you should be earning 2,740 reputation per run. Also ran Heroic El Vergel Eterno. Killing _every_ mob in there with the bonus gave a reputation gain of 6,144. So based on this, you are better off doing Heroic El Vergel Eterno if your time is limited. However take note that if you do not get a cooperative group, they may choose not to pull every bit of trash in the instance and may even take the shortcuts to bypass the bulk of them. Funny how no one mentions the easiest way to get rep in this xpac (especially given how easy gold is to get). Buy and use Medallón de la Legión, no grinding for me thanks! Dont forget your Tartar de oso as some of the packs are close enough to sprint without having to mount up for. If you want to loot (you will get 0 cloth here but some few apexis, greens and greys), Saqueatrón de Findle works here for engineers and nonengineers alike, so support your local engineer and buy one today! If you remember something about "Apexis dailies" and "Scouting Missives" offering quests in the area, you are correct, but neither offer any rep reward. If there is a Shattrath apexis daily up on your apexis daily table inside your garrison, then by all means take it for free apexis. 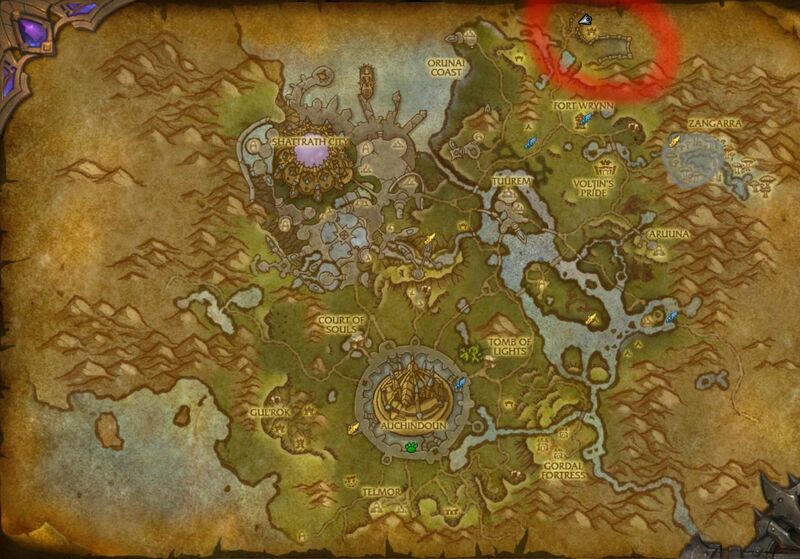 If you have spare garrison resources and need apexis then you can do 2 scouting missives in this area while you farm, killing 2 birds with 1 stone: Misiva: Asalto al Puerto de Shattrath and Misiva: Asalto al corazón de Shattrath (alliance versions in the 'see also' tab). You buy them for 200gr from your garrison quartermasters Sergeant Grimjaw/ Sergeant Crowler, both near your garrison cache. But please note that you can only accept 1 type of each missive at a time, and you have to return to your garrision to turn them in. Best bet is to farm Medallón de la Legión. 1200 rep with Trading Post level 2. To speed up the process use the crate with Suministros del Consejo: velocidad (found in Shattrath Harbor) and Tartar de oso. Los defensores de Shattrath luchan por recuperar el control de su capital tras haber sido traicionados por sus congéneres.